Streamlined and simple? Layered and complex? Blinking, beeping and spinning? The options for decorating your DealGift are almost endless. With almost 30 years of experience creating awards for the banking, legal, real estate and creative industries, we’ve seen and done an awful lot! Here are some of the most common additions you can use to make a DealGift uniquely yours. Embedments: While not everything can be successfully embedded in Lucite, several materials work wonderfully. Pewter castings are the most common, and are available in hundreds of stock designs and sizes. They can also be plated with other metallic finishes. Specially-designed paper, glass and plastics can also be embedded. If you have an out-of-the ordinary item you’d like to embed, we can run a test embedment in advance. Because Lucite is baked at high temperatures, some materials cannot withstand the manufacturing process, so this is important. 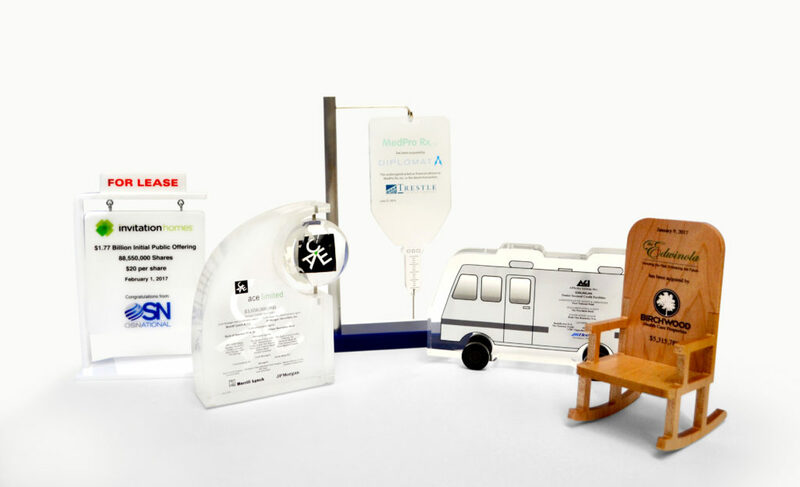 Models: It is often possible for us to create very accurate replicas of a product or material. Lucite is surprisingly versatile–it can be whipped to achieve a foamy look (think beer), left semi-polished to resemble ice or stone, and layered with translucent, opaque or stone-effect plexiglass. Using lasers, waterjets and other shaping tools, almost any look can be achieved. We also work in wood, metal, glass, crystal and resin—the only limits are imagination and budget! Sound, Lights, and Drama: In some cases, the client wants a piece that really jumps off the shelf. Light-up bases, sound chips, magnets, hinges and springs can open the door to a truly one-of-a-kind showstopper. Laser-cut metal plates, either embedded in Lucite or sandwiched between 2 plaques. Sandblasting or sandblast-effect printing, to add a subtle emphasis. Models that cannot be embedded, mounted on a custom base. Spinners: globes, wheels, logos, you name it. Colored bottom—can be matched to any Pantone color. A variety of stone affects are also available. Frame—to create a shadowbox effect. Can be metal, wood or acrylic. Inspired? Give us a call to start building your masterpiece today!